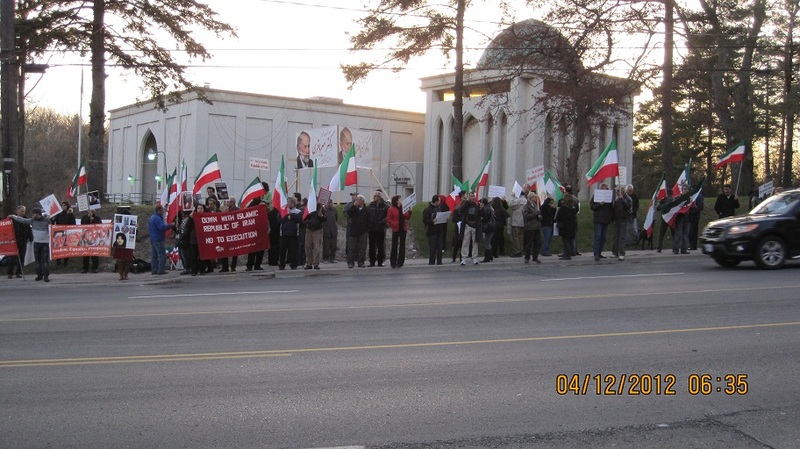 About 100 Iranians gathered in front of the Imam Mahdi Islamic Centre to protest the mosque's ties and affiliation with the Islamic Regime in Iran, as well as the presence of a speaker Mr. Mir Bagheri, a religion professor who is also linked to the Regime in Iran. Today once again we were able to show the Regime that Iranians can unite and when we do our voice is loud, clear and strong. It was wonderful to see people from many different groups and organizations including leftists, Mojahedin, monarchists and those who support a secular republic all stand together with various flags and signs chanting "down with the Islamic Regime in Iran." The strong voice of unity was able to shake down the walls of the mosque and the cores of the Islamic Regime. We will not allow the Regime to make Canada into a safe heavan to promote its barbaric Islam! Big thanks to everyone who came, and let's keep it up, keep our voices loud and strong and force the Regime and its lobbies into the holes that they belong.